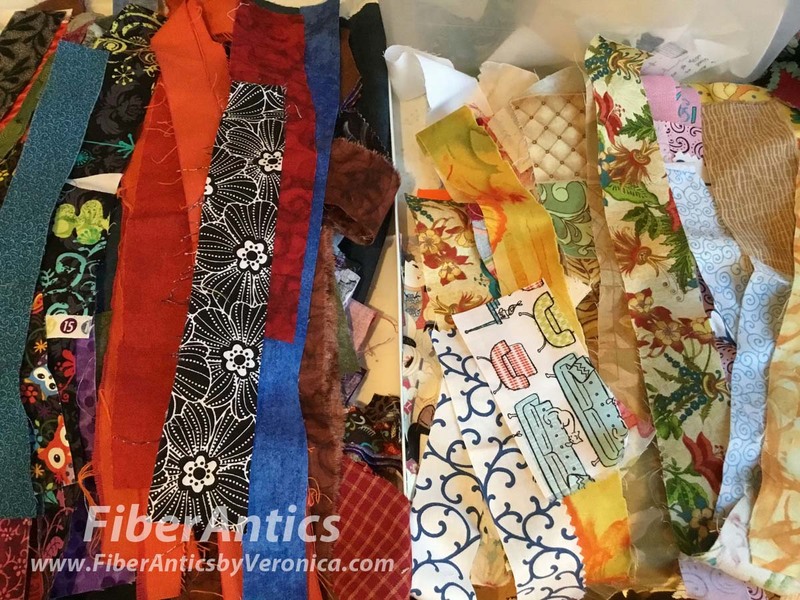 Since starting my purging and repurposing episode back in January, I've sorted lots of fabric bits and pieces this year... bags and bins of all kinds of trimmings and leftovers. The scraps are going into quilt blocks for charity projects and lately I'm having fun with improv log cabin blocks. 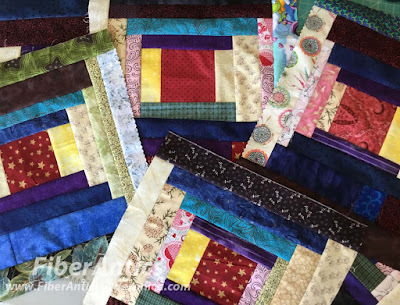 Improv log cabin blocks from fabric scraps. Both of my quilt guilds have a community service project, and I also make small quilts for the kitties at the Cat Clinic. 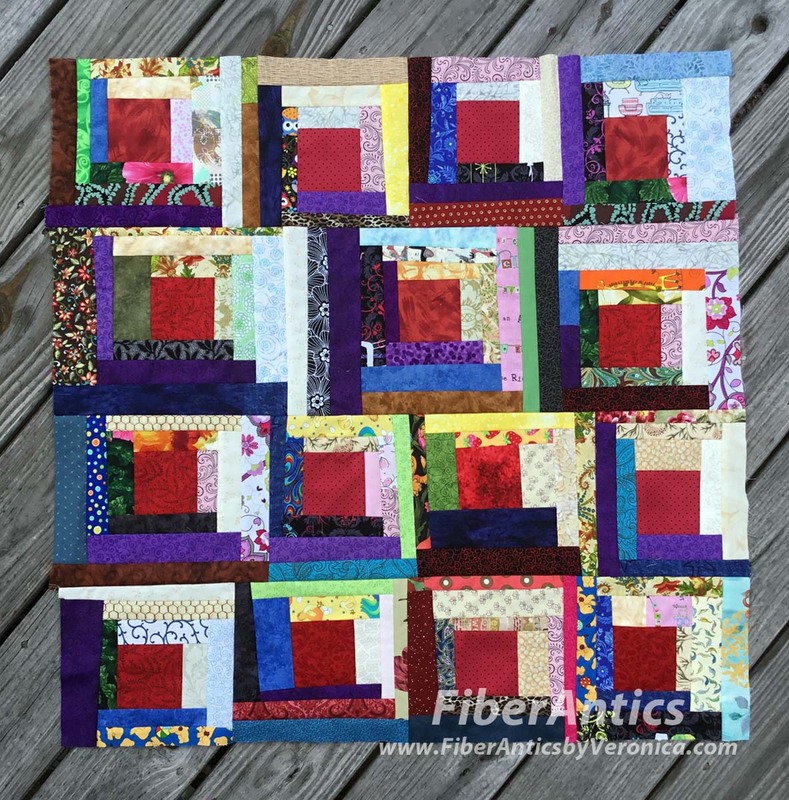 Because I'm working with log cabin blocks, the fabric gets sorted by value—darks and lights. 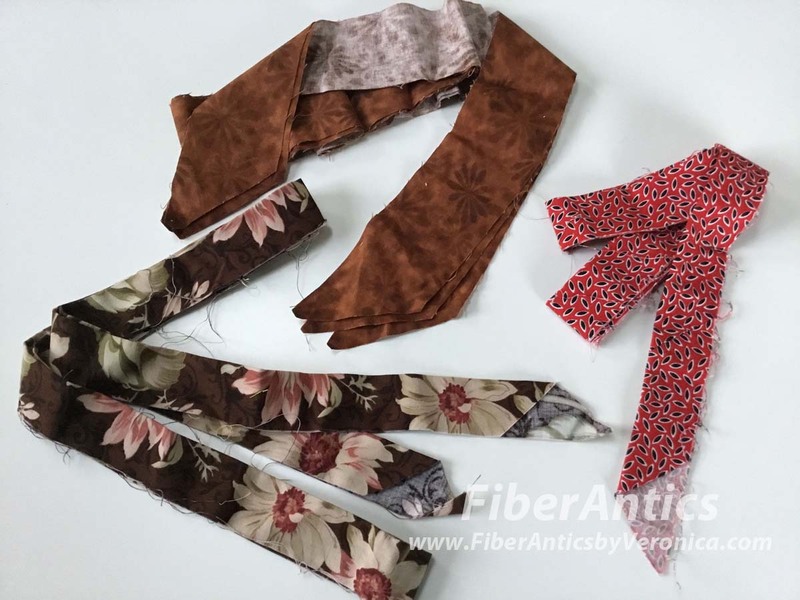 Sorting fabric strips by dark and light values. 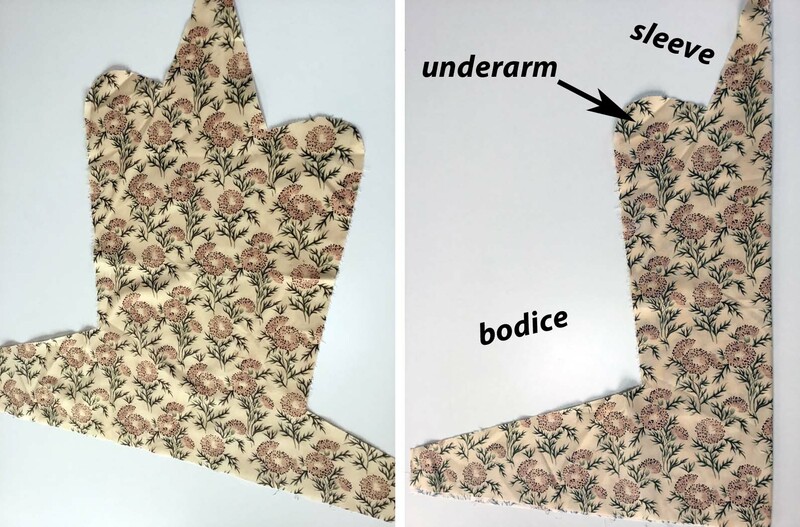 In her book, "Clues in the Calico," quilt historian Barbara Brackman provides insight into how to read the "clues" in the fabrics of vintage and antique quilts to identify and date both the fabrics and the time the quilt was made. During my recent fabric foraging escapades, I'm finding clues about the quilters and sewers themselves—and the kinds of projects they made—by looking at how the scraps were cut. It's a safe guess that these strips are quilt bindings—likely the remaining lengths. They're between 2.25" and 2.5" wide and some were folded and pressed in half. Conclusion: these scraps are from a quilter. Quilt bindings among the scraps. This one shows the mark where strips were joined. The pencil mark for joining the binding. This larger scrap had an odd shape cut-out. It makes more sense when looked at folded. I'm guessing a garment was cut from this piece. Conclusion: this sewer made garments with quilting cottons. Leftover fabric piece from a garment. Here's another symmetrical scrap that was cut with the fabric folded. The project had scallops... possibly an apron or curtains?? The whimsical chicken-and-egg print also lends a clue that the project was something for the kitchen. Conclusion: this sewer/quilter made accessories or items for the home. 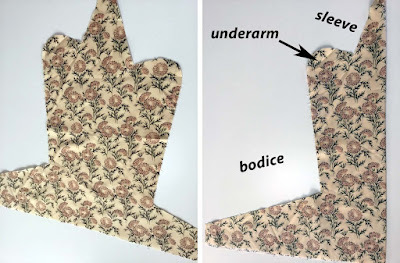 Scalloped shape cut on the fold. Because these trimmings were stuck together—20 or more layers thick—they were all likely cut at the same time. They were also interlaced with a white muslin. The curved shape could be for a garment or another item. It is not clear. Conclusion: these scraps came from a manufacturer's production run. 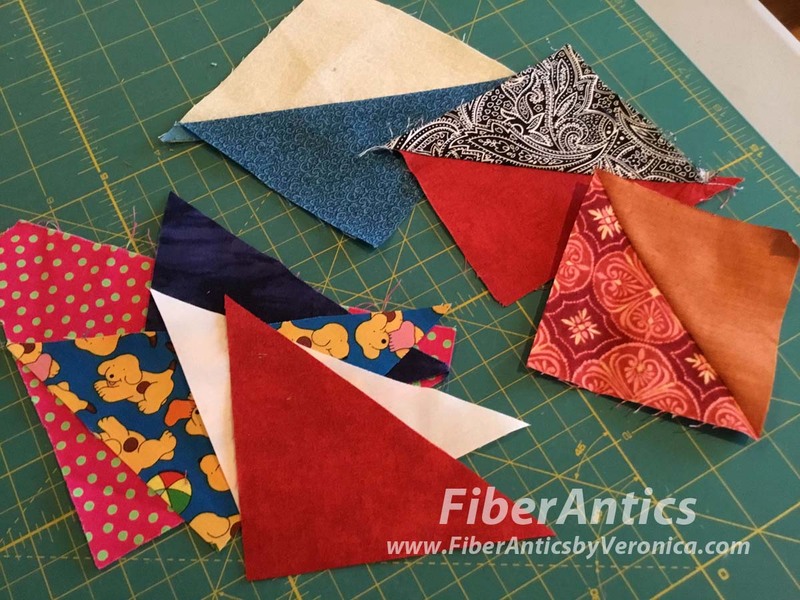 For these manufacturer's scraps, I cut them into triangles for half-square triangle units. Half-square triangles make good use of scraps. I only found one scrap that looked to be from an appliqué project. Generally these fabrics look like swiss cheese with various shapes fussy-cut from a larger piece of fabric. 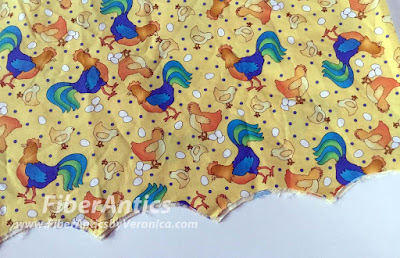 Quilters who like to appliqué also tend to keep their small scraps because they can use them. Scrap from an appliqué project. So those are the clues I uncovered in the scraps and the conclusions I've drawn about their backstories. Do they sound plausible? I think there are clues in the calico, and also in the cutting! 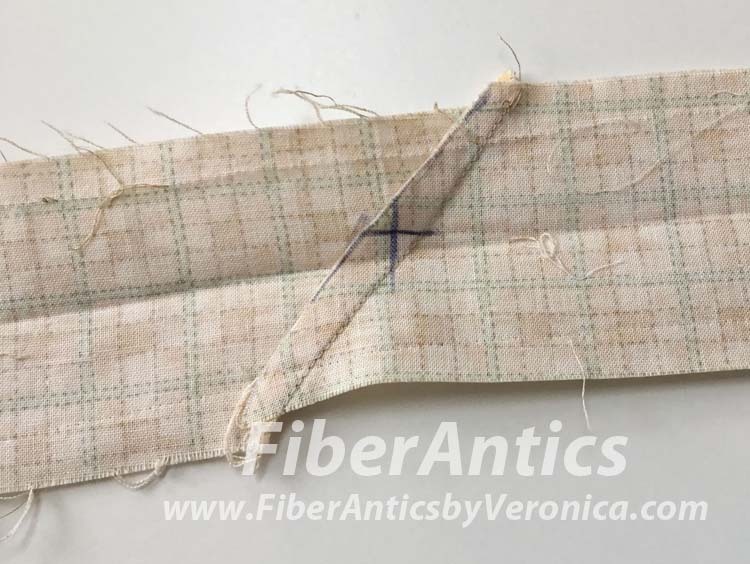 Do you ever do detective work on fabric scraps? If they're not your own personal scraps (or even if they are, our scraps baskets run deep), put on your detective cap and discover (or remember) their past life. And then, of course, repurpose them and send them into the world with a new life! Below are my improv log cabin blocks that are beginning a new life as Cuddle Quilts. I showed these tops at a recent guild meeting. 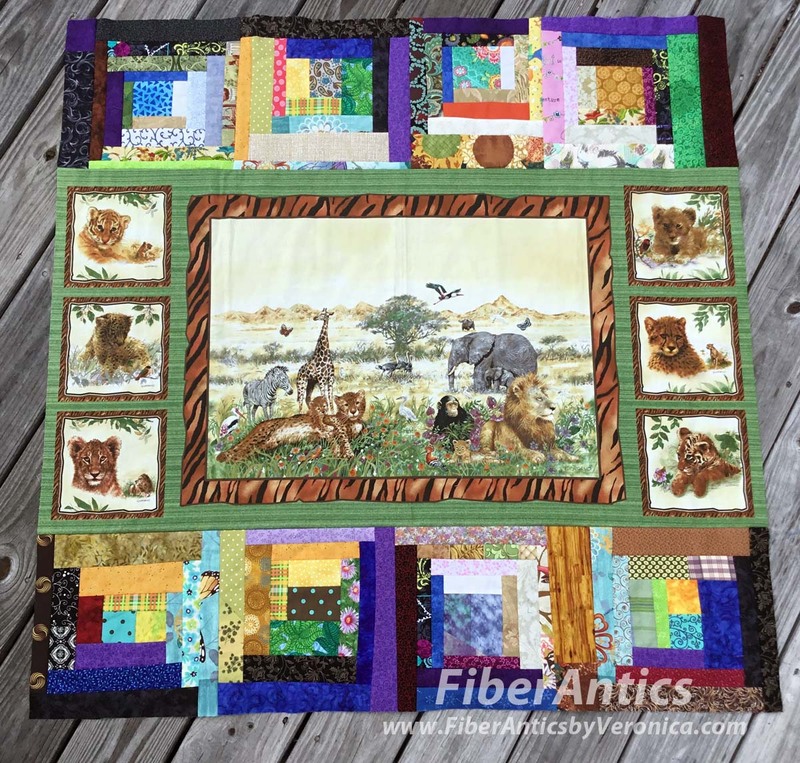 Improv log cabin blocks add length to a horizontal fabric panel.